Recently, articles have been posted about Far East Aviation and Far East Flying School in which FEA’s auto dealer affiliate Far East Motors was briefly mentioned. Far East Motors was founded in 1934 when Far East Aviation was awarded the exclusive dealership of Chevrolet (Chevy) in HK and South China by American auto giant General Motors. Its first location was at 26 Nathan Road in Kowloon next to the Peninsula Hotel with 15000 sq ft of space and capacity to hold up to 30-40 cars. In addition to Chevy, the firm also distributed two other brands of General Motors – Cadillac and Holden (made in Australia) and Standard Motor and Armstrong Siddeley automobiles from the UK and also dealt in used cars. The first manager of Far East Motors was an American by the name of Claude Ellsworth White (1893-1952, C.E. White). A native of California, he left home at the age of 15 to work in shipping in the Far East. His name first appeared in the HK Jurors List in 1923 as an assistant at Alexander Ross & Co, the distributor of Ford in HK before Harpers. In 1931, White was listed as sales manager at the Hongkong Hotel. In 1938, John Robinson, who had worked at Bradley & Co (德記洋行) in Swatow and in ticketing at the Pan Am-backed Chinese airline CNAC, acquired control of the Far East group of companies and he kept White at the helm of Far East Motors. In 1939, White hired Gerhard Neumann (1917-1997), a young German with some engineering training as the chief mechanic of Far East Motors. As Neumann recalled in his memoir, the clients of FEM at the time included the Governor and prominent figures such as Lawrence Kadoorie. When Germany went to war with the UK in September 1939, all German residents in HK were interned in La Salle College in Kowloon, and it was thanks to a guarantee by Lawrence Kadoorie that Neumann was released. Neumann continued to work in HK until June 1940 when the colonial government expelled all German residents from the colony but thanks to the help of CNAC manager William Langham Bond, he moved to Yunnan to work as a mechanic for General Chennault’s Flying Tigers. Eventually he moved to the US after the War where he worked for the aircraft engine division of General Electric for 32 years and achieve fame as the “father of jet engines”. 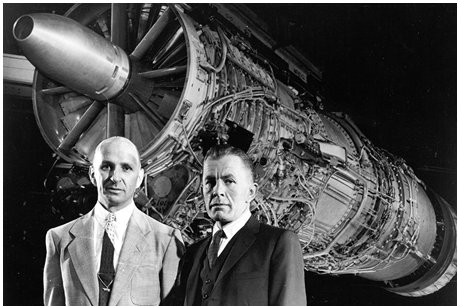 Former chief mechanic of Far East Motors in HK – Gerhard Neumann (left) and Neil Burgess in front of the J79 turbojet engine they designed for GE in 1958. When the Japanese occupied HK, C.E. White was briefly thrown into a concentration camp but was repatriated to the US as an exchange internee in February 1942. 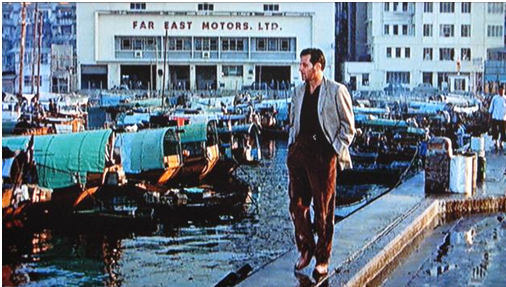 After the War, he returned to HK to resume the operations of Far East Motors at 26 Nathan Road. Far East Motors Ltd was formally incorporated as a separate entity in 1948 with C.E. White as manager, C.P. Basto as sales manager and Gilbert Mayne as service manager. 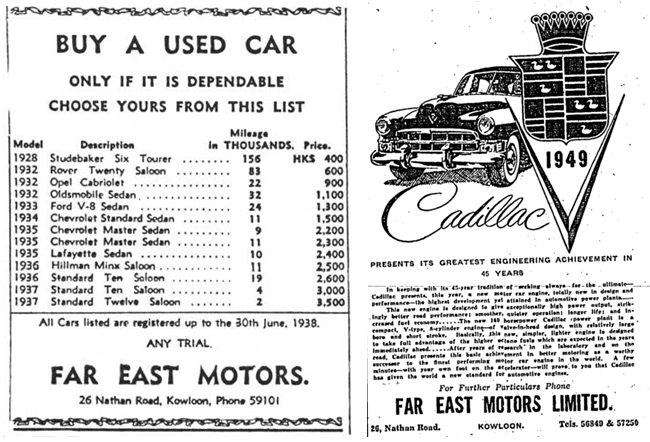 In the early 1950s, the Soares family which owned 26 Nathan Road decided to evict Far East Motors as property value in the emerging “Golden Mile” in TST rose. The site was ultimately sold to building contractor Ching Chun-kau (程振球) who in turn sold it to the Chan Kwan-tung family who developed the site into the Ambassador Hotel in 1960 (since been re-developed into a 28-story commercial building in 1998). 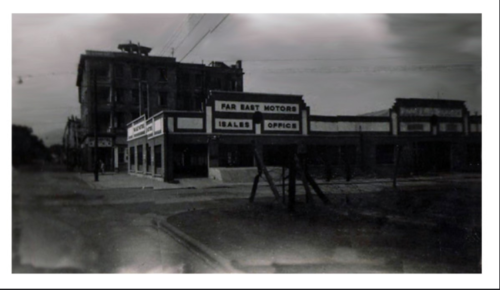 As a result, Far East Motors had to relocate and they decided to move across the harbor. In December 1954, the new Far East Motors location opened on Gloucester Road in Wanchai. The 3-story building had three floors connected by ramps (relatively novel in HK at the time) and had room for 100 cars. The ground floor housed the repairs department that could work on 8 cars simultaneously, while the paint department was on the second floor and the garage was on the third floor. In 1957, Ching Chun-kau (who acquired 26 Nathan Road) was appointed Kowloon and New Territories agent for Far East Motors. In the late 1950s, Far East Motors was acquired by the Hutchison group which was growing rapidly through acquisitions under the leadership of Sir Douglas Clague. It was grouped together with two other dealers owned by Hutchison – Turin Motors (distributor of Fiat) and Hua Nan Motors (distributor of Renault, see our related article) under Hutchison-Boag and managed by D.C.P. Nixon, Clague’s right hand man. In the 1960s, the firm distributed Hino trucks from Japan and Massey Ferguson tractors in addition to its 3 GM brands and entered the rental car business with the formation of Far East Self-Drive Ltd in 1960, which was renamed Far East Rent-A-Car in 1969 when the firm became the first Asian licensee of the American car rental giant Avis Rent-A-Car (owned by ITT at the time). Starting out with car rentals (of mostly Fiat and Holden automobiles which the firm also distributed) at its Gloucester Road location, the firm relocated to Watson Estate on Watson Road in North Point in 1974 and also added a service center on Sung Wong Toi Road near the old Kai Tak Airport in Kowloon. Far East Motors and Turin Motors were dissolved in 2000 but Far East Rent-A-Car continues to operate the local Avis franchise to this day. 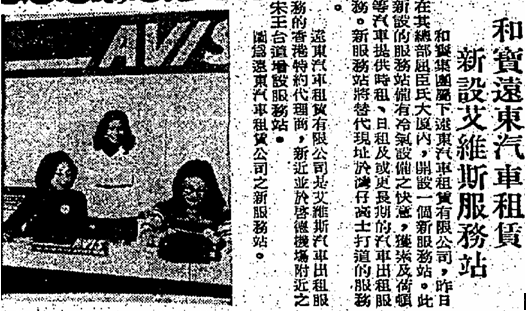 “Kowloon’s Latest Garage: Far East Motors Ltd” The China Mail Feb 9. 1934. This article was first posted on 22nd November 2017. My grandfather, John Robinson, also worked for Bradley and Co in Swatow. I wonder if he is the same John Robinson mentioned above in the industrial history. Do you have further information about him or old photos?